These General Conditions of Sale and Delivery apply to all sales from CMS Dental ApS (hereinafter "CMS Dental"). The intention is briefly to inform about the condi­tions which CMS Dental apply to the sales of Goods (hereinafter "Goods") in addition to what follows from the applicable law in Denmark. 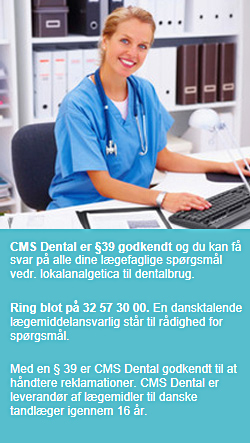 1.1 As a basic principle all sales of Goods from CMS Dental are governed by the Danish Sales of Goods Act. Based on this, CMS Dental only claims the exceptions set out below in these General Conditions, or which have been agreed on in writing in connection with an individual purchase. 2.1 The purchase price of the Goods is stated in the order confirmation. 3.1 CMS Dental will ship using United Parcel services (UPS). They buyer may choose between standard or express services. The cost of shipping is stated on the order confirmation. Alternatively the Buyer may choose to arrange freight using any shipping company to pick up the goods. In this case the delivery conditions are to be interpreted in accordance with the INCO­TERMS in force at the time of the conclusion of the sale, and the delivery shall be considered Ex Works. 4.1 The buyer is obliged to examine the Goods carefully upon receipt. The buyer shall immediately and not later than eight days from receipt of the Goods notify and describe such defects on the Goods delivered as the buyer has or ought to have found. The buyer cannot claim any defect that could have been found at such an examination. Complaints shall always be made within 12 months from delivery. 4.2 Sales to dentists: Dentists are granted the right to return purchased products for full credit within 14 days of invoice date. The dentist must return the goods at own costs to the address on the delivery note. Consumable products that have been opened will NOT be refunded. The credit will be made to same credit card account that was charged for the purchase. 5.1 Payment terms are specified on order confirmation. 5.2 In the case of late payment, i.e. payment after the due date mentioned in the invoice, CMS Dental will charge interest according to the Danish Act on Interest, i.e. an interest according to official bank rate quoted by Danmarks Nationalbank ["referencesats"] + 7 %. 6.1 In so far as reservation of title is legal according to applicable law, the Goods shall remain the pro­perty of CMS Dental until payment of the Goods has been made in full. 7.1 CMS Dental guarantees that the Goods conform to the specifications mentioned in the order confirmation within the tolerances that are normal and generally accepted within the business. CMS Dental does not guarantee the appropriateness for special purposes of the Goods, unless it has been mentioned specifically by the buyer in the order and is stated expressly in the order confirmation. 8.1 CMS Dental's advice on the Goods' use for specific purposes is only to be considered informative, and as the buyer's use of the Goods is beyond the control of CMS Dental's, CMS Dental cannot be held liable for the buyer's concrete use of the Goods. CMS Dental can further not be held liable for any damage or loss due to wrongful and unusual use of the Goods. 9.1 CMS Dental does the outmost in order to deliver the Goods free of defects in due time to all customers. If CMS Dental exceptionally does not succeed in doing so, CMS Dental undertakes the following liabili­ty: Up to a maximum corresponding to 25% of the purchase price of the Goods, CMS Dental shall indemnify the buyer for the direct losses suffered due to CMS Dental's delivery of defect or delayed Goods, provided that the defect or the delay is caused by negligence on the part of CMS Dental. 9.2 CMS Dental is not liable for any indirect losses, including but not limited to loss of production­, loss of profit, loss as a consequ­ence of market disturbances and other conse­quential losses, no matter if CMS Dental can be blamed for such damage. 9.3 CMS Dental's liability ends within 12 months after the date of delivery. 9.4 CMS Dental is not liable for any defect or delay that is caused by transportation, storage, wrongful handling of the Goods and any neglect caused by a third party. 10.1 CMS Dental shall be liable for damages caused by defective products delivered by CMS Dental in accordance with the Product Liability Act and unwritten product liability rules of Danish law. 10.2 CMS Dental shall not liable for any damages that may be attributed to incorrect or unusual use of the Goods. Likewise, CMS Dental shall not be liable for any damage of real property or tangible assets, unless CMS Dental has acted with gross negligence. 10.3 However, if liability arises pursuant to the above, such liability shall not include operating loss, loss of time and other indirect loss. Unless otherwise agreed in writing, liability for damage to property cannot exceed Euro 50.000 per incident or series of incidents caused by the same delivery. 10.4 If a third party files a claim against the buyer for liability according to the product liability rules, the buyer shall immediately notify CMS Dental hereof. The buyer shall discharge CMS Dental if liability in excess of the above-mentioned limitation of liability is imposed on CMS Dental. 11.1 Neither the buyer nor CMS Dental can influence cir­cumstances beyond their con­trol. Consequently, neither CMS Dental nor the buyer shall be liable for failure to fulfil the agreement due to events beyond their control (force majeure), however, only to the extent and as long as these circumstances prevent the parties from fulfilling the obliga­tions under this agreement. The following circumstances shall be considered as cause for relief for both parties, if they prevent the fulfilment of the agreement or make performance unreasonably onerous: Industrial disputes and any other circumstance beyond the control of the parties such as fire, war, mobilization or military call up of a comparable scope, requisi­tion, seizure, changes in statutory regulations, currency restrictions, insurrection and civil commotion, shor­tage of transport, general shorta­ge of materials, restrictions in the use of power and defects or delays in deliveries by sub-contractors due to any such circum­stance as referred to in this paragraph. 12.1 Any dispute that arises out of or in connection with any deliveries from CMS Dental shall be settled according to Danish Law. The Danish rules on the conflicts of laws and the United States Convention on Contracts for the International Sale of Goods (CISG) shall not apply to any sale of Goods from CMS Dental.